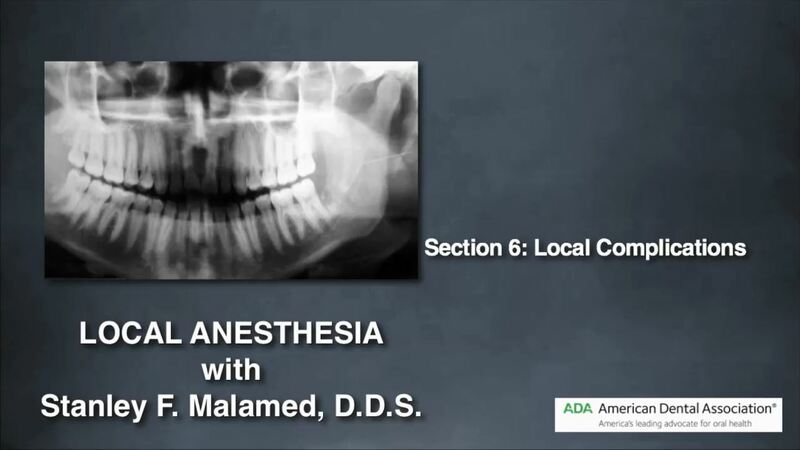 Local Anesthesia Part 9: What's New in Dental Local Anesthesia? Though local anesthetics are safe and effective, considerable research is on-going to make them even more effective. Computer-controlled local anesthetic delivery systems (C-CLAD) and buffered local anesthetic solutions promise to allow painless injections to be delivered to dental patients almost anywhere in the oral cavity. Fear of injections is primarily based on the needle. 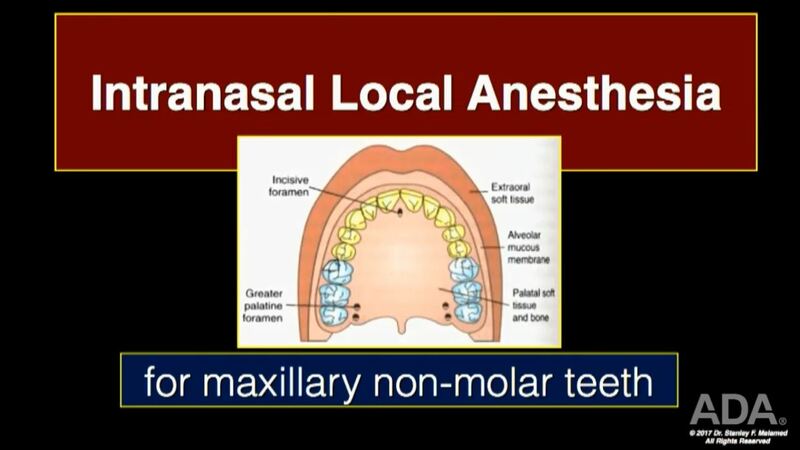 The development of an intranasal local anesthetic mist has been shown to provide successful pulpal anesthesia of maxillary teeth – without a needle. Epinephrine is added to injectable local anesthetics to increase their effectiveness, duration and safety. However the duration of residual soft tissue anesthesia – usually unnecessary and occasionally a potential danger – is extended when epinephrine is used in the anesthetic solution. Self-inflicted soft tissue injury is a real problem associated with this anesthesia in all patient age groups but especially pediatric and geriatric patients. Phentolamine mesylate – an alpha adrenergic antagonist – has been shown to significantly reduce the duration of residual soft tissue anesthesia when administered at the conclusion of the traumatic part of dental treatment. Articaine HCl was introduced in the USA in 2000 and has become a very popular anesthetic agent. Though classified as an amide local anesthetic it is actually a hybrid molecule, possessing both ester and amide characteristics. With epinephrine, articaine provides approximately 60 minutes of pulpal anesthesia and between 3 to 5 hours of soft tissue anesthesia. Its unique molecular characteristics make articaine a preferred anesthetic in the pregnant and the nursing patient as well as the lighter weight (<30kg) pediatric patient. However, articaine is used as a 4% solution and there has been some concern about the possibility of 4% anesthetics possessing a greater risk of producing paresthesia than local anesthetics used in lesser concentrations. This program provides an in-depth look at articaine, its advantages and disadvantages when compared with other commonly used dental local anesthetics. We also discuss the ‘controversy’ alleging an increased risk of paresthesia following administration of 4% local anesthetics. Complications associated with local anesthetic administration are rare. 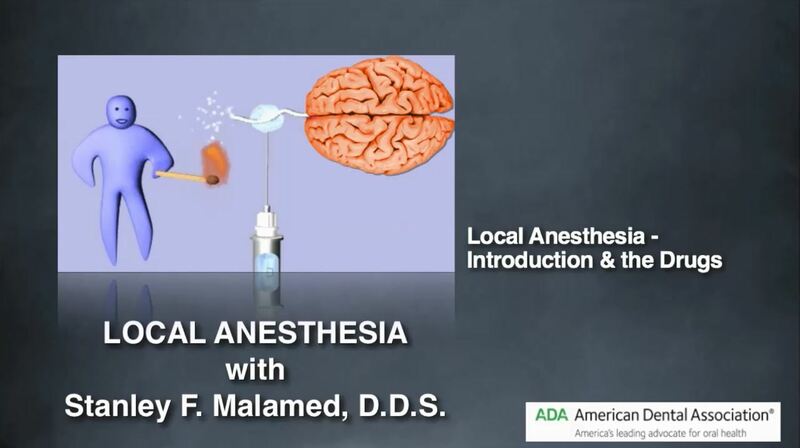 This program discusses complications occurring in and around the site of local anesthetic drug administration - facial nerve paralysis, hematoma, paresthesia, trismus and needle breakage, their prevention, recognition and management as well as the two systemic adverse drug reactions – allergy and overdose – are reviewed as each relates to the administration of local anesthetic drugs. Local anesthetic techniques providing pain control in the maxillary arch are described in this program following a review of the anatomy of the trigeminal nerve. Techniques include infiltration (supraperiosteal), anterior superior alveolar nerve block; middle superior alveolar nerve block; posterior superior alveolar nerve block; anterior superior alveolar nerve block; and palatal injection techniques. 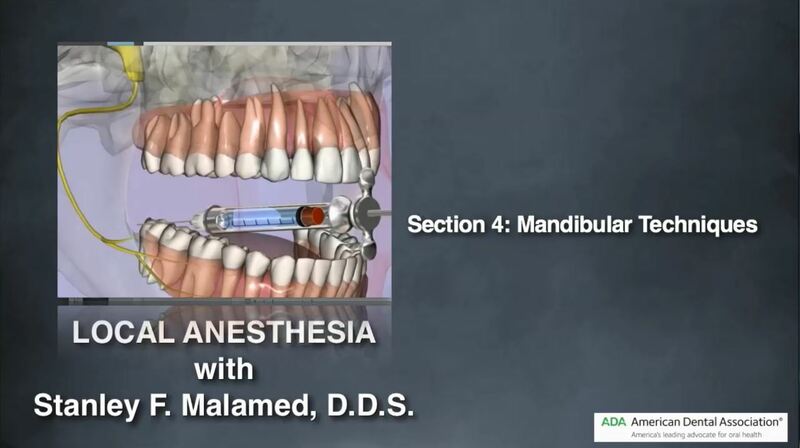 Techniques of anesthesia in the mandible are reviewed in this program, including the traditional inferior alveolar, Gow-Gates, Vazirani-Akinosi, and incisive nerve blocks as well as several non-traditional injection techniques including the periodontal ligament injection, intraosseous anesthesia and the administration of the local anesthetic articaine HCl by mandibular infiltration in adult patients. The basic armamentarium for the administration of local anesthetics includes the syringe, cartridge and needle. Proper assembly and use of these items minimizes the risk of complications arising during injection, such as shattering of cartridges and needle breakage. Prior to the administration of drugs the doctor is expected to have knowledge of the health status of the patient receiving the injection. The medical history questionnaire is reviewed with an emphasis on local anesthetic-related concerns. As the delivery of ‘painless’ injections is foremost on the patient’s list of dental desires, the basic local anesthetic injection technique is reviewed. 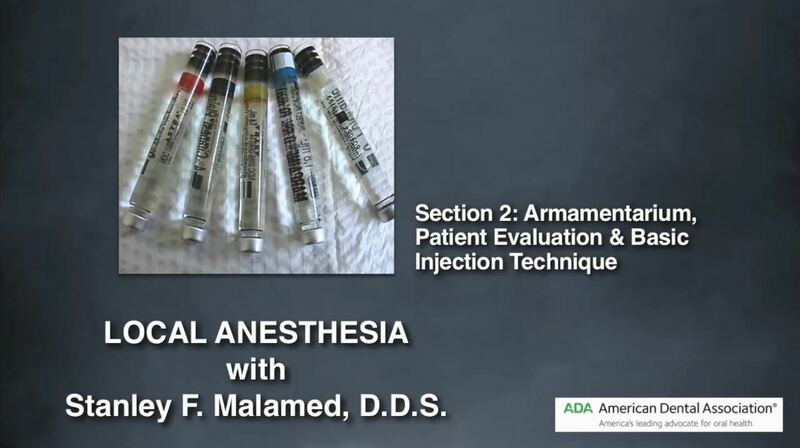 The basic armamentarium for local anesthetic delivery – the syringe, cartridge and needle – is reviewed in this program along with evaluation of the patient prior to receiving an injection. 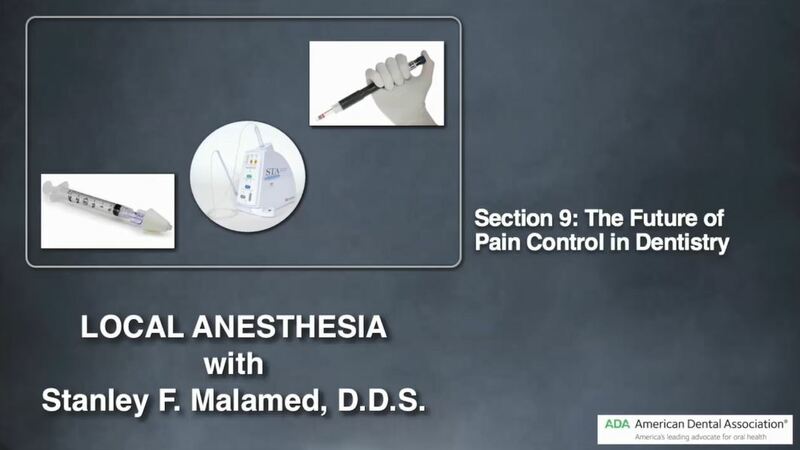 A step-by-step review of the basic local anesthetic injection technique is provided. Local anesthetics, the most used drugs in dentistry, are the safest & most effective drugs for the prevention and management of pain. However the act of receiving an injection – the ‘shot’ – is the most fear-inducing part of the dental experience for most patients. 75% of all dental office medical emergencies are ‘stress’ related and therefore preventable in most situations. Techniques of managing fear including inhalation and oral sedation are reviewed. The pain reaction threshold (PRT) is introduced followed by a discussion of the effect of various clinical situations, e.g. pain, infection and fear, on the PRT. The currently available (in North America) local anesthetic formulations are discussed with an emphasis on their expected duration of clinical action. 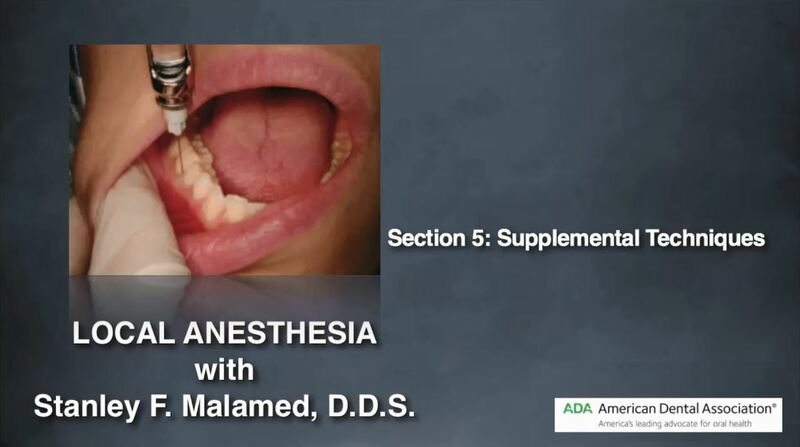 This program reviews the development of local anesthetics and the drug formulations that are currently available in dentistry. The effect of fear & anxiety on local anesthetic effectiveness is discussed along with an introduction to sedation – a very important ally in the quest for effective pain control. This course is for dentists who provide minimal and moderate sedation and provides didactic instruction for patient assessment and monitoring. Particular emphasis is placed on airway management techniques. Describe qualities of dentist leadership of the in-office dental anesthesia team. Recognize sedation levels and general anesthesia in terms of clinical characteristics and influence on respiratory and cardiovascular function. Describe essential features of preoperative assessment for patients undergoing dental treatment under sedation or general anesthesia. Identify principles of patient monitoring distinguishing requirements for moderate sedation versus deep sedation/general anesthesia. 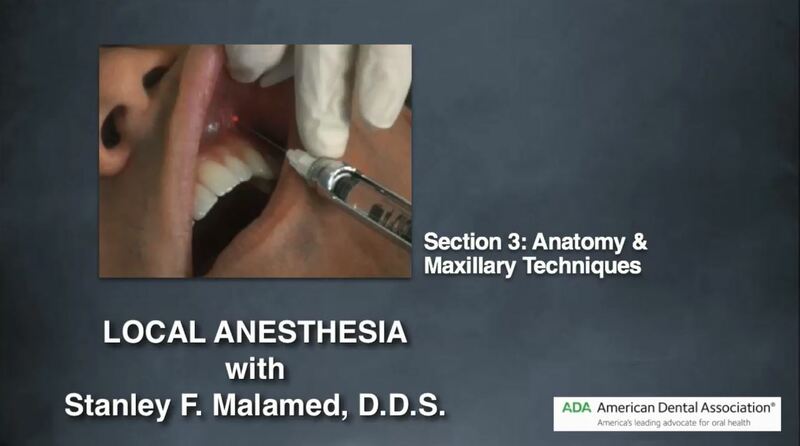 Explain proper airway maintenance during sedation and general anesthesia. Discuss the proper use of devices for oxygenation and ventilation. 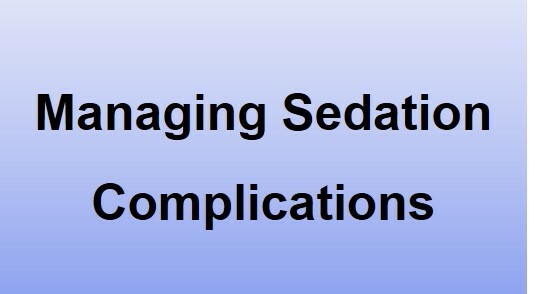 Describe the pathogenesis, recognition and appropriate management of possible complications associated with moderate sedation, including essential pharmacology of emergency drugs that may be required. The course is designed to train the practicing dentist in the proper recognition and management of respiratory complications that may be associated with the use of moderate sedation. Local anesthesia (LA) forms the backbone of pain control techniques in dentistry. The receipt of a LA injection is, unfortunately, the most traumatic part of the dental procedure for most patients. Trypanophobia (fear of needles) is estimated to be present in ~10% of the world’s population. Fainting during LA injection is, far and away, the most common medical emergency encountered in dentistry. The ability to obtain profound pulpal anesthesia for restorative dental procedures without injection will enable a dentist to provide comfortable, safe and effective treatment to many needle-phobic persons who previously avoided seeking dental care. An intranasal local anesthetic mist – a combination of tetracaine HCl and oxymetazoline – has been developed that provides pulpal anesthesia to the maxillary non-molar teeth. In this program Dr. Malamed will discuss the problem of needle-phobia as well as the development and efficacy of this new intranasal local anesthetic mist. List the advantages of tetracaine HCL for use as an intranasal local anesthetic mist and explain the rational for the inclusion of oxymetazoline. This course is sponsored by St. Renatus, LLC.